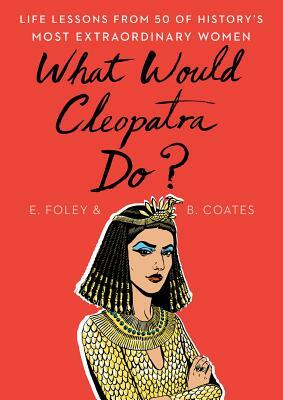 Irreverent, inspirational, and a visual delight, What Would Cleopatra Do? shares the wisdom and advice passed down from Cleopatra, Queen Victoria, Dorothy Parker, and forty-seven other heroines from past eras on how to handle an array of common problems women have encountered throughout history and still face today. What Would Cleopatra Do? tackles issues by reminding us of inspiring feminists from the past, telling their stories with warmth, humor, and verve. From sticking up for yourself, improving body image, deciding whether to have children, finding a mentor, getting dumped, feeling like an imposter, being unattractive, and dealing with gossip, we can learn a lot by reading motivational stories of heroic women who, living in much tougher times through history, took control of their own destinies and made life work for them. Here are Cleopatra’s thoughts on sibling rivalry, Mae West on positive body image, Frida Kahlo on finding your style, Catherine the Great on dealing with gossip, Agatha Christie on getting dumped, Hedy Lamarr on being underestimated—to list only a few—as well as others who address dilemmas including career-planning, female friendship, loneliness, financial management, and political engagement. Featuring whimsical illustrations by L.A.-based artist Bijou Karman, What Would Cleopatra Do? is a distinctive, witty, and gift-worthy tribute to history’s outstanding women. Elizabeth Foley is the editor and author (with Beth Coates) of the bestselling Homework for Grown-Ups, as well as Shakespeare for Grown-Ups and What Would Cleopatra Do?